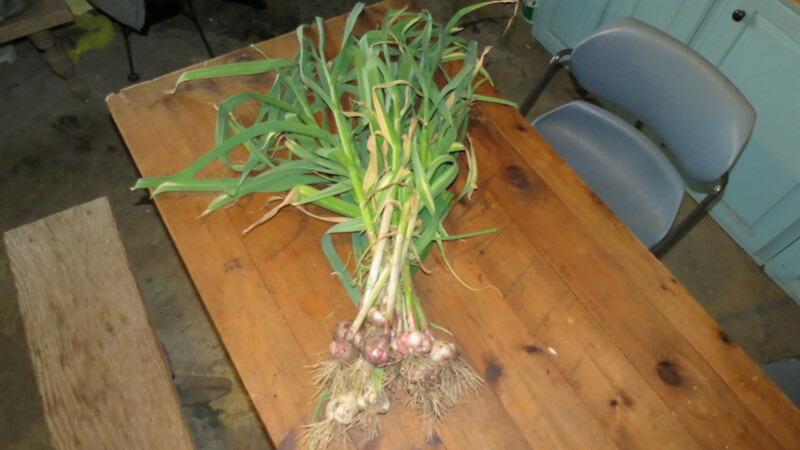 Yes, that’s right, we are picking garlic for this week, and you get stems and all. Before you throw out the stems, don’t do it, they are good to eat, no lie! I like to slice them and fry them with eggs, or meat and the flavor and texture is superb! This will possibly be one of the first experiences with fresh food. The super markets don’t have tops because they don’t store, or ship well. But really, they are great, and a bonus for getting fresh picked produce! Turnip greens top the list in vitamin content, and are among the highest containing calcium of all leafy greens. Here is a quick and simple recipe to help you use your turnip greens. For those with half shares, just cut the recipe in half, and those with large families, you can double it. I have also added small amounts of bacon and maple syrup to this recipe as a variation. You will receive pea shoots in your CSA this week too. This may be another new food to try, they taste just like peas, and contain the very same nutrients as peas do. Place the garlic and pea shoots in a blender and process until smooth. Add the toasted walnuts and blend briefly. Do not over process, as the nuts will take on a floury consistency. Turn the pea shoot mixture into a bowl then add the Parmesan. Gradually add the olive oil until you have reached a thick coating consistency. Season with salt and pepper to taste. We’ve got some wonderful salad blend coming your way too-yum! The salad is again a blend of lettuce and greens we started early this spring. Remember this recipe from the farm meet and greet? Combine all ingredients and refrigerate for 1-2 hours before serving. I am also including Chives so you can make it. Our Iris garden is ready to share, and our peonies may be popping out this week too! We have some exciting things coming on, again on a first pick status. I will try to make sure that all of you get some asparagus and now we are picking small quantities of strawberries, and kale is coming to those who received asparagus last week. Another rotation I need to make are eggs. Rob wanted to squeeze the chickens last week to get enough for everyone, but I wouldn’t let him. Instead, we will be rotating the weeks by location and our first rotation will be Goodness Grows and Frostburg for this week. Bedford will be next, and Cumberland will follow. Also, we can reuse the bags from last week for week 3 delivery, please return them for reuse. Thank you in advance for helping us recycle the bags! Sounds great! I can’t wait to start planning my menu for the weekend. We just had your greens and radishes in a salad and used the eggs in a jalapeno popper quiche for dinner tonight…delicious! I can’t wait to see your post for the week…so exciting! Hi Dawn, My name is Elaine Grabill and I spoke to you last week on the phone. �I am the person who didn’t receive share b/c another couple picked it up with their share (at Wholesome Living at Bedford). �You mentioned you would try to double my share this week, but I don’t think that happened. �I am fine with not receiving a double share, but could you at least give me the goat soap from last week’s share? �I am excited to try it! Can anyone confirm that next Saturday (6-8-13) that Goodness Grows is having a special event (all day) and that all are invited to see the farm from an operational perspective? Yes it is true. We start milking Goats at 7:30 am. We are working all day, and finish with milking at 7:30 pm. Now, I don’t expect anyone to put those kind of hours in, aside from myself, but all are invited to see what we do here. It is a real working on the farm day, and if you’d like to come for part of it, you’re invited! Dawn, what is in the plastic container with the chilves? Also friends have talked me into trying turnips. So would it be too much trouble to add turnips to my “yes” list? Pea shoots are in with the chives. Se the recipe above for pea shoot pesto, or you can google pea shoot recipes. They are super tasty, and many upscale restaraunts use them on the menus.